A lot of the focus on marketing for eCommerce store is placed on advertising, pay-per-click campaigns, or other customer acquisition strategies. However, there are tons of opportunities to market to users who are already on your site to improve conversion rates or customer retention. There are several examples of missed opportunities for retention or further marketing on eCommerce sites. For example, Receiptful takes advantage of receipt emails, which are the most frequently opened emails, as a marketing opportunity. This idea is the driving principle behind our Happy Checkout app, which allows you to improve and customize your Shopify thank you page. By default, the thank you (or “order received”) page is generic and simply shows the customer details about the order, but this a great place to gather feedback from the customer on the shopping experience, upcoming products, or other info. HubSpot encourages the use of surveys and other marketing tactics, but they’re not the only one — popular blogs like KISSmetrics and Copy Hackers also encourage using the thank you page more effectively. …surveying visitors on your thank-you page can elevate their happiness with you. Let’s start with how to add a survey to the Shopify thank you page. If you already use our Happy Checkout app, we do have a step-by-step guide to adding a survey, but we’ll go through the full process here. Install the Happy Checkout app (here’s an installation guide). This app will let you customize your thank you page by adding social media integrations (i.e., follow us on Twitter, tweet about your purchase, etc), videos, or other custom content. 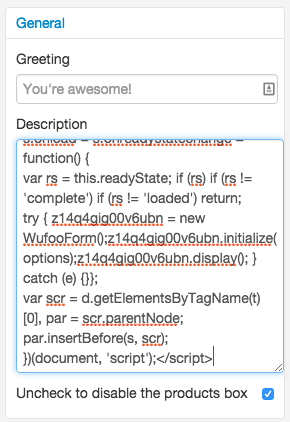 (Optional) Set up Happy Checkout — add social widgets, videos, etc. The “general” section is the one that will let us embed our survey form shortly. Sign up for a free Wufoo account. 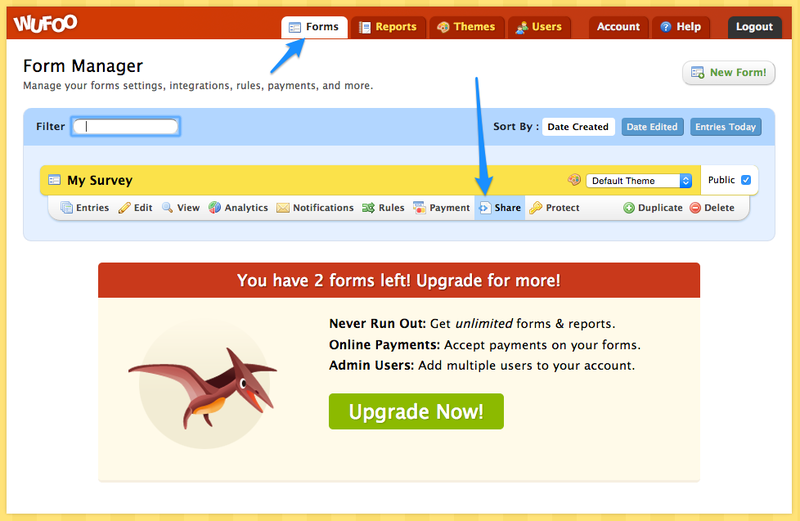 Wufoo is a form builder service that makes it easy to create a form, then embed it on your website or thank you page. A free account will let you create up to three different forms with a maximum of 10 fields each. We should keep our survey shorter than this anyway, so a free account is perfect. You can accept 100 form submissions (for your entire account) per month, and upgrade to a paid plan if your survey becomes popular enough to gather more submissions than this. Once you’re logged into your Wufoo account, we can add a form. 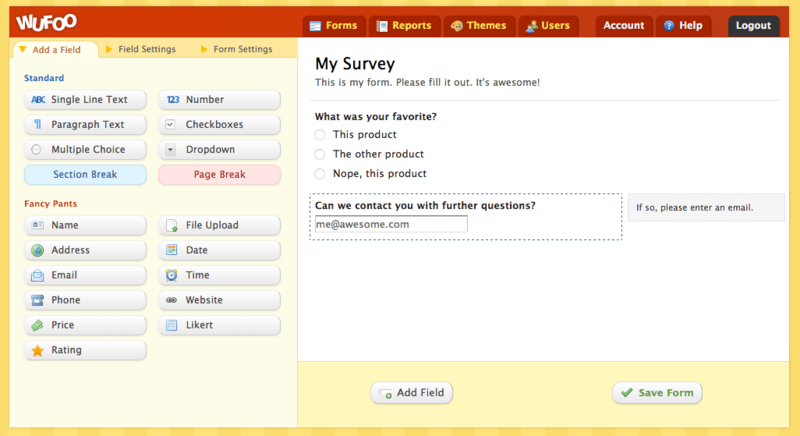 Create your feedback survey / form in Wufoo by adding fields for the questions you want answered. Keep your survey short (up to a few questions) and save your form. You’re done! 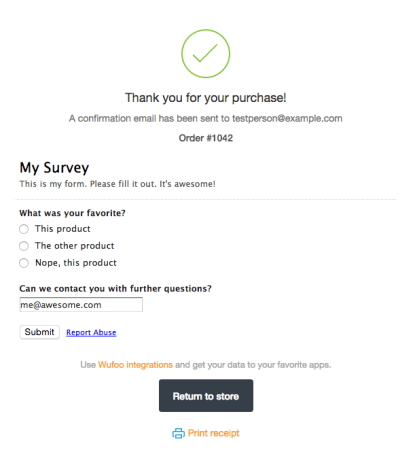 Every thank you page will now have your survey embedded so users can complete it without leaving the order confirmation. When the survey is submitted, a thank you message is displayed in its place, and customers can continue to read your thank you page or use other actions without having to submit a survey on a separate site.